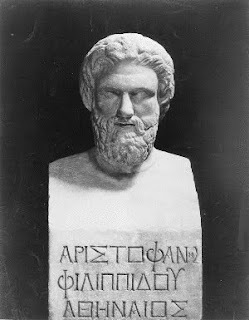 Image: Aristophanes; An Athenian playwrite who was particularly scathing in criticism of war profiteers. We in the West, especially the American people, live in a culture of big lies and mass political deception, a culture that is largely shaped by the mass media and government propaganda but made worse by self-deception within the minds of millions of people who are not ready to discover that their highest political leaders from all political parties are subverting democracy, cruelly betraying their hopes and freedoms, and destroying their future for their own selfish interests. The death of representative government did not happen overnight. At the end of World War II, the growth of intelligence and national security agencies gave rise to a class of securocrats who profit when there is a cultivated climate of fear, paranoia, and hysteria about foreign enemies. The game of national security is so profitable that the leaders of intelligence agencies in cooperation with influential political and media figures invent enemies and threats to keep the people in a state of fear and in constant need of security. When the threat of communism faded away into history the mythic threat of Islamism was manufactured, and brought to life on September 11, 2001, the day that saw the culmination of high-level planning by the top leaders of the Bush administration, the Republican and Democratic parties, the CIA, the Pentagon, and Israel. The other forces besides the treasonous securocrats that are hostile to the people's freedoms and happiness are the politically connected monopolistic corporations that profit from government manufactured industries such as security, warfare, and surveillance, Wall Street, and private international banks that make trillions of dollars by lending counterfeit money to national governments at usurious interest. The American people suffer at the hands of these bloodsuckers more than any other people because they have to pay an unconstitutional and scandalous income tax which is administered by the private and foreign owned Federal Reserve Bank. The income tax is not used to maintain the infrastructure of America, pay for education and natural resource development, or provide jobs and training for the people, but simply to pay off an unjust debt to politically savvy bankers who operate above the law and above the constitution of the United States. The wealth of America has been squandered and wasted by these anti-freedom and unlawful forces that control the political, legal, and taxing apparatus of the federal government. When their power and influence was resisted by President John F. Kennedy they naturally resisted and killed him in the light of day. JFK's death was a message to aspiring political leaders that if they challenge the Federal Reserve, the securocrats, and the military-industrial complex, they will be executed and their heroic deed will be forgotten. Professor Peter Dale Scott has done great historical research into the black-op assassination of John F. Kennedy, the CIA's drug-dealing activities in South America and Afghanistan, and connected these undiscussed historical facts with the false flag attacks on September 11, 2001. Professor Scott says the political system of the United States has a democratic and legal character on the surface but in reality it is no more representative of the people's aspirations than any other dictatorial regime in the world. By nature, intelligence agencies revolve around secrecy and suppression of information, making them the perfect avenues for treasonous and anti-democratic agendas, as Allen Dulles said. Dulles was a director of the CIA who was fired by John F. Kennedy, and later served as a member of the Warren Commission. It refers to a parallel secret government, organized by the intelligence and security apparatus, financed by drugs, and engaging in illicit violence, to protect the status and interests of the military against threats from intellectuals, religious groups, and occasionally the constitutional government. Professor Scott's research into Kennedy's murder, as well as the research done by others, such as James W. Douglass, author of "JFK and the Unspeakable: Why He Died and Why It Matters," opens up a hidden history of the United States of America, and adds a much greater significance to Kennedy's death. William F. Peeper's book on the CIA-FBI's assassination of Martin Luther King Jr. called "An Act of State: The Execution of Martin Luther King," is also necessary reading for any person who wants to know the truth about the fall and decline of America. If JFK, MLK, and RFK had lived America would not be the monstrous killing machine that it is today. The American people were robbed of their country and constitutional freedoms when the lives of these three men were taken by government bullets. Once the method of political assassination is used by powerful individuals to change the political leadership of a country because they don't agree with their policies and vision, that country is no longer free. What kind of peace do I mean? What kind of peace do we seek? Not a Pax Americana enforced on the world by American weapons of war. Not the peace of the grave or the security of the slave. I am talking about genuine peace, the kind of peace that makes life on earth worth living, the kind that enables men and nations to grow and to hope and to build a better life for their children--not merely peace for Americans but peace for all men and women--not merely peace in our time but peace for all time. After Kennedy died, evil men took charge of America, and no leader since him has been brave and wise enough to attempt to change course and return America to its revolutionary and constitutional roots. Even worse, America has been cursed with mad men like neocons who unlike Kennedy and King dream of total war and don't mind using nuclear weapons to carry out their demonic plans to strategically dominate the Middle East and secure its oil reserves. It is a cruel joke that good men are killed and their deeds are forgotten while "we let the little demons run amok," as Bill Hicks pointed out. John F. Kennedy and Martin Luther King Jr. were giants in comparison with current American political leaders. No one can truly know what America lost when those two leaders were murdered. They were just as revolutionary and far-seeing as America's founding fathers. Imagine if John Adams, Thomas Jefferson, and James Madison were killed by the British government in 1777. The American Republic would have never gotten off the ground. Kennedy and King's dream of peace was just as important in 1963 and 1968 as the dream of political independence and freedom in 1776. Almost fifty years after the assassinations of John F. Kennedy and Martin Luther King Jr., America has never been in greater danger of being destroyed by traitors and tyrants who have seized the machinery of Washington's shadow government, academic think tanks, and mass media. The political struggle for the country that they were engaged in during the 1960s was never resolved. The demons of war never quieted down, they just learned to be more sneaky and pursue their goals through covert means. After the fall of the Soviet Union, they became more powerful and ambitious than ever, and deceived America into embarking on a hollow odyssey against terrorism in the beginning of the 21st century. The fact that a fraudulent, criminal, nonsensical and evil war on terror is still being fought nearly a decade after the government-led 9/11 attacks is a big sign that America is lost. America hasn't lost the war, it has lost its soul. The country is in the biggest constitutional and political crisis in its history. The time for short-sighted and miniscule reforms has passed. The type of change America needs now is a cultural, social, and political revolution against the Federal Reserve System, military-industrial complex, two-party system, and Wall Street. A new American revolution need not be driven by arms and blind hate, but by acts of peaceful civil disobedience based on a common consensus. I am Canadian but I believe if America is not free and independent then Canada and Mexico cannot be free and independent either. We share the same continent and the same hopes and dreams for the future, but we should not share the same political system and the same police state. There is a great need for political and historical understanding of why we are in this situation. It is critical that we recover lost history and lost knowledge about the true purpose of the Federal Reserve, the reasons for the killing of JFK and MLK, and the U.S. government's real motivations behind the 9/11 attacks and the war on terror. If we are knowledgeable and aware we may prevent a deeper decline in the West and come together to face the future with hope and courage. But before moving forward, we must first admit the fact that the middle classes and the poor of America, Canada, and other Western nations are being betrayed by top political leaders, and that Western democracies have been corrupted and overturned by political and elitist traitors who are acting in union with each other against the common interests, health, and security of the people. I don't want this generation to be the generation that let freedom die forever. So many men in America, Canada, England, and other nations have given their blood and sacrificed their personal dreams to defend and preserve freedom for the people. If we do half of what they did then we'll preserve the gift of freedom for future generations, too.